The Restwood Motel has been family owned and operated for over 30 years in Traverse City, Michigan. We are located less than a mile from many beautiful public beaches and attractions in Traverse City. Traverse City, MI is a great place for families, business travelers, outdoor enthusiasts, and young couples because it has something to offer for everyone. Our motel is in a great location to take it all in. If you visit Michigan in the early summertime, make sure to check out the National Cherry Festival. The month of July has plenty of activities to keep you busy including a month long Equestrian Festival and the Film Festival (an entire week). In the late summer, Traverse City has the perfect weather to host the Sleeping Bear Dunes Grass and Blues Festival. Make sure to take a look at our motel's attractions page before lodging with us to get more information on all of these exciting events. 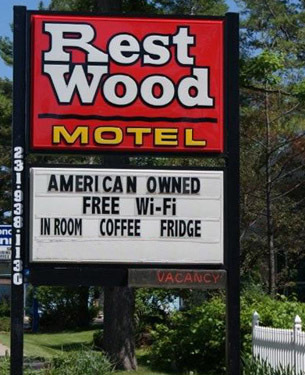 The Restwood Motel is excited to have you as our guest. Our Motel is American owned and operated to provide you with the best possible service during your stay. Along with our traditional rooms, we also offer great cabins. Motels in the area just don't compare. Begin relaxing today with our easy online reservations. Call us to check our rates and availability.